2421 Miles is a site-specific 52,000 square foot earthwork by New York-based artist Molly Dilworth. Using over 400 cubic yards of dirt and 182 lbs of wildflower and grass seed, Dilworth transforms the interior site of the ALL RISE campus into a living urban meadow. Comprised of 14 individual garden beds each containing a specific colorway, 2421 Miles is based a series of painted pattern studies generated from national flags, corporate logos and traditional patterns found along the sea trade route between Seattle and New York. In recent years, Dilworth has spent time in ports along the Hudson River, studying the history of commerce between the United States and the Caribbean. At the same time, she traveled between her home in New York and Seattle as a freelance worker for a global technology company. The work is named for that commute - the number of miles between the airports of Seattle and New York - made possible by modern global trade. As shipping and port technologies evolved over the last century, formerly industrial areas such as South Lake Union have been redeveloped. 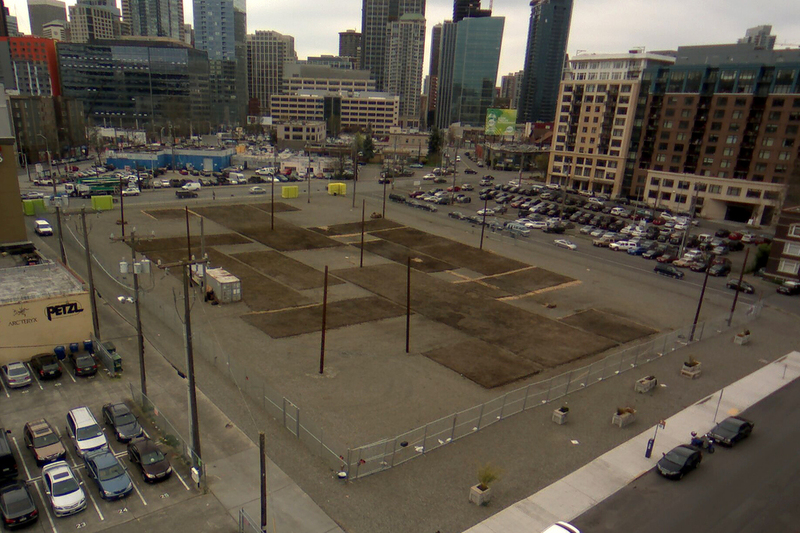 In a short time this lot on Denny will be a power station serving the demands of the new buildings; All Rise has used this temporary space to mark a transition between last century and ours. The geometric edges of the garden will soften and evolve as it grows, just as our built environment and technologies do: imperceptibly, right in front of our eyes and seemingly all at once. 2421 Miles will bloom through mid-June, 2015. It is visible in person at 1250 Denny Way, Seattle and also online through ALL RISE webcams here and here. The project was realized with the design assistance of Walker Macy (Portland and Seattle) as well as expertise and custom mixes from ProTime Lawn Seed, soil from Cedar Grove, and the advice of SunMark Seeds. Molly Dilworth will discuss her research-driven, globally contemplative practice, including large scale projects for Times Square and, 2124 Miles for ALL RISE. The event is sponsored by the Cornish College of the Arts Art Department and ALL RISE, and is free and open to the public. Molly Dilworth’s works have been commissioned for the Salina Art Center, Salina, KS; World Financial Center Plaza, New York, NY; Times Square, New York, NY; Pulse Projects, New York, NY and exhibited at Pacific Northwest College of Art, Portland, OR; MASS MOCA; David B. Smith Gallery, Denver, CO and Pomona College Museum of Art, Claremont, CA, among other institutions internationally. From 2003-2005, she was a contributor to Red Shoe Delivery Service, which traveled to the Melbourne International Arts Festival, Melbourne, Australia; Nottdance Festival, Nottingham, England; Swiss Institute of Contemporary Art, New York, NY; and Time Based Arts Festival, Portland, OR. She is the recipient of recent grants and fellowships from the Pollock-Krasner Foundation (2012), the New York Foundation for the Arts (2012), the Vermont Studio Center (2012), Recess Activities/Pioneer Works (2012), the Lower Manhattan Cultural Council Workspace Program (2013) and Smack-Mellon (2014). In the spring of 2013 Dilworth installed a permanent exterior painting for the Garden at The James Hotel in Lower Manhattan. She is currently working on a mural and community project for Toledo and a sculpture for a light rail station in Denver.